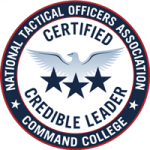 The Three Star NTOA Certified Credible Leader is designed for those who wish to be certified and recognized at the international level. Letter of Accomplishment – A letter of accomplishment mailed to the candidate recognizing him or her as a NTOA Three Star Credible Leader. Every Officer is a Leader – The following five clusters require a textbook: “Every Officer is a Leader: Coaching Leadership, Learning, and Performance in Justice, Public Safety, and Security Organizations” by Anderson et. al. (2008) – 2 Hrs.